Remember Duz? Duz laundry detergent got out all kinds of dirt and stains. 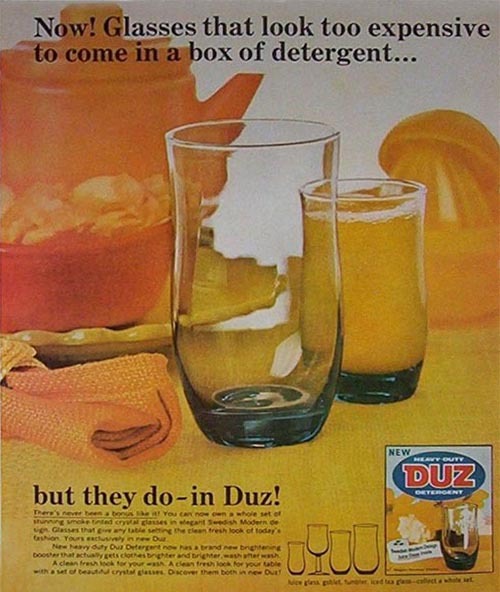 But just in case you didn’t really believe that, in the 1940’s and 50’s you could furnish your kitchen with good old Duz. Goblets and dinner plates, flatware and dish towels all came free with Duz laundry detergent. You might get a little pasteboard box containing a teacup in your Duz this week, assuring you’d buy more to get the saucer next week. I don’t remember how well it cleaned the laundry but Duz did one thing well, it sure sold laundry detergent. I still have a couple of those smoky-gray goblets, good as the day mama bought them. Perk-a perk-a perk perk, a perka perk perk… can’t you smell the “good to the last drop” Maxwell House percolating? The perky commercial stuck in your mind and when you hit the grocery store, why naturally you had to buy a bag. The last time I used a percolater it was to heat water for instant coffee. Boy, my days are different now. 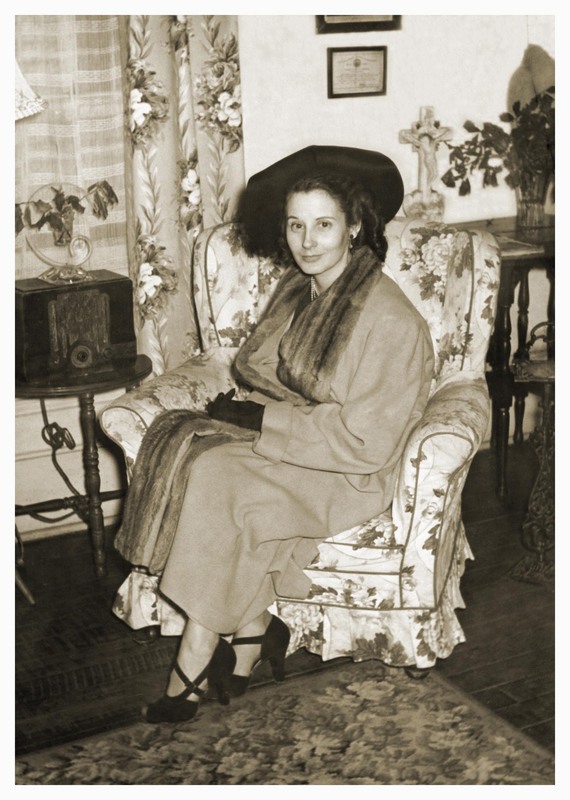 For several months in the late 1940’s my family occupied an upstairs apartment in a big two-story house. One memorable summer morning I wandered around indoors looking for something interesting to do. I had already cut out all my paper dolls, read all my comic books and colored all my coloring book. Etta (our housekeeper/babysitter) was in the kitchen ironing the Duz-fresh laundry, sipping Maxwell House coffee and listening to Don McNeil’s Breakfast Club on the radio. Harold occupied himself with his Lionel trains or something. I couldn’t jump rope indoors. Couldn’t play hopskotch indoors. Needed more girls to play jacks. What to do? Making my way into the living room I spied that remarkable gadget, our very first telephone. 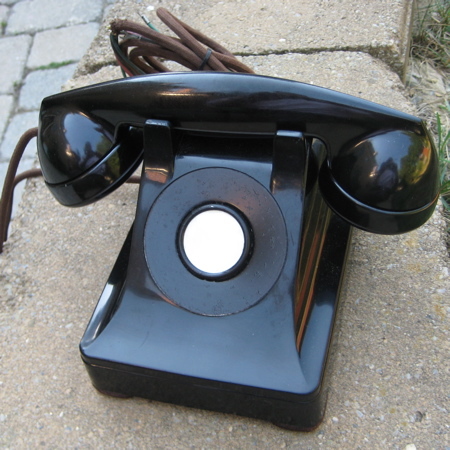 Heavy and bulky, there was no dial, just mostly a smooth black surface. Hmm. My curiosity getting the best of me, I raised the receiver to my ear to see what it sounded like in there. A lady’s voice demanded “Number please.” Startled, I was afraid to hang up — the woman in the phone might know where I lived! But I didn’t know any telephone numbers, not even our own, so, quick-thinking me asked for my mother’s office. The kindly telephone operator looked up the number and said, “I’ll connect you now.” And she did. Of course I got a good talking-to since the phone was strictly off-limits except in an emergency, and “What time are you coming home” wasn’t exactly an emergency. I explained as best I could that it was all a terrible misunderstanding, but I had a feeling there would be another talking-to when mama did come home. Well, dress-up was always fun. I made a beeline for mama and daddy’s bedroom. I carefully lifted the lid of mama’s jewelry box and listened to the little tune, then fingered through the dainty necklaces and earrings. Selecting several mismatched drop sapphire earrings, I carefully screwed them onto my lobes. I added a crinkly crenoline to my ensemble, adjusting the waist with a safety pin. A gold knit top came next, picked and pilled with a few runs in it too, but I loved it. I carefully hitched up a black felt skirt over the crenoline. Knee-length on mama, it was evening dress length on me. I cinched a wide elastic belt in place to fasten everything and knew I looked glamorous. Next I perched a black straw pillbox atop my head, untangling the veil and pulling it down. By the time I got all that netting straightened out it stretched nearly to my chin. Oh well, more glamor! Finally I slipped my toes into a pair of mama’s high heels. Clinging to the sofa, I rose to my wobbly feet and attempted to strut across the living room. I soon discovered I needed a bit more padding in a few strategic spots, including my feet. Maneuvering in those slippers proved to be a real drag, especially when I had to yank my stockings back up every minute or so. I didn’t care; I was Marlene Dietrich to my heart’s content that morning. In spite of my telephone misadventure I had a lot of fun that day, mostly with stuff that doesn’t exist any more. Of course, I do still have those two Duz goblets and the orphan screw-on sapphire earbobs. They might be worth a lot on E-bay these days, but they’re worth a lot more in memories to me. Mama died in 1970. Mama’s mother, my grandmother Mimi, died in 1973. 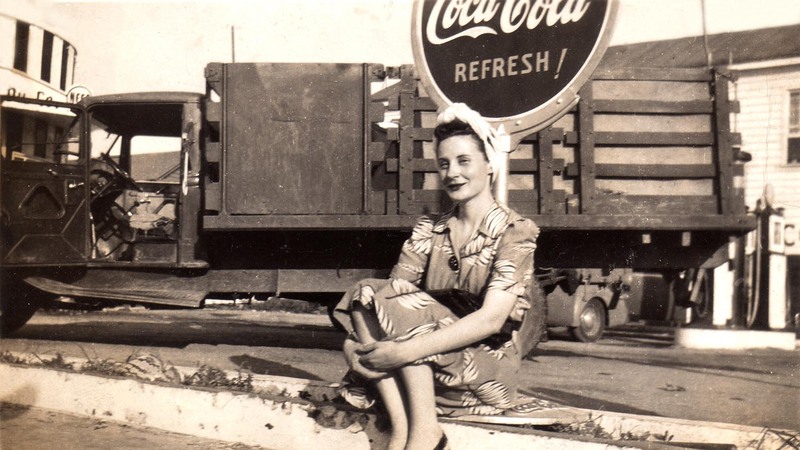 Daddy’s mother died when I was only two and I have no memories of her at all, but I wish they were all still here to celebrate Mother’s Day with me. Here’s a slightly re-arranged post from several years ago. Washing dishes was my daily duty after school. There weren’t many plates and forks to wash but oh those pots and pans! Steel wool time. Every afternoon I dillied and dallied until it was nearly time for mama’s car to drive up before I ran the dishwater. Seldom did I get an early start and have the kitchen spick and span before her arrival home. Soon it was time to peel something like onions or potatoes, slice something like cucumbers or tomatoes, or grate something, like cheese. Cheese for cheese biscuits, cheese for macaroni and cheese, cheese for cheese grits, any of which was a favorite on the supper menu; or cabbage for cole slaw, which wasn’t. In between chores, mama taught us the three R’s, particularly reading, from the time we could hold one of those thick-paged baby books. While my grandmother Mimi subscribed to every magazine she could think of, mama loved books. There were library books, new and used paperbacks and hardback books on many different subjects. How-to books on electricity, plumbing and math, informational books on Southern Snakes or Southern Skies, science fiction books by Isaac Asimov et al and Christian books by Dr. Norman Vincent Peale — everywhere you looked there was a book or two on an end table. Reading for themselves and reading to us was as natural to my parents as preparing meals or paying bills. You just did it. When I needed spending money over and above my weekly allowance, mama taught me how to do office work. She’d bring home box-fulls of envelopes and letters, show me the proper way to fold a page in thirds and stuff it in an envelope, then the easy way to seal a batch of stuffed envelopes. Fan the flaps out so only the gummed part of each one is showing, then run a damp sponge across all the flaps at once and quickly flip each flap into place. Nothing to it. She’d pronounce my work acceptable and pay me a dollar or so. We’d discuss many things while we worked, school, friends, hair styles, grades, books, newspaper articles, homework assignments — come to think of it, school got into our conversation a lot in those days.